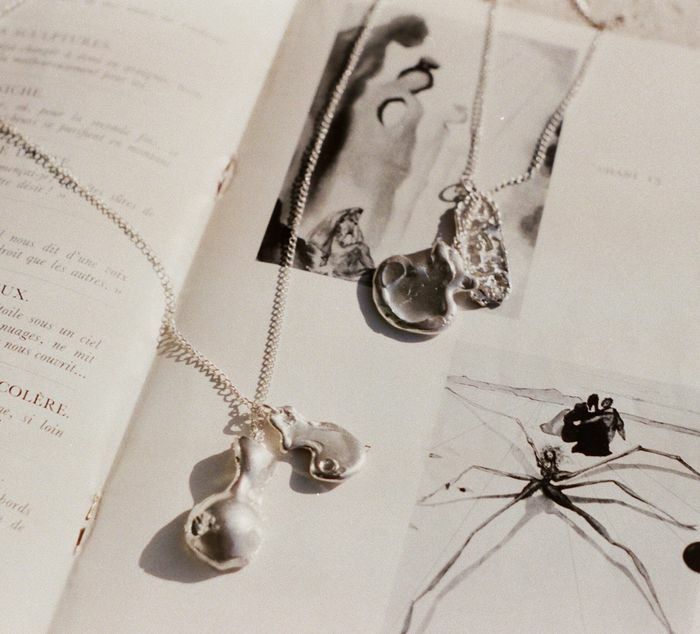 This year the fashion crowd has fallen hard for the small London-based jewellery label Alighieri. You'll spot the distinctive gold medallion necklaces that look like ancient world treasures on many street style stars, but until now the brand's designer, Rosh Mahtani, has only created pieces for those of us who wear primarily gold jewellery or happily mix our metals. However, she has now teamed up with Joseph to create her distinctive textured pendants and earrings in solid silver. Part of what makes Alighieri jewellery so special—and covetable—is that each piece is unique, making it feel more like your very own antiquity. The aim of the brand is to create modern pieces that look like precious heirlooms, and her designs are all inspired by literature—her medallions reference Dante Alighieri's poem "Divine Comedy" and reflect different moments in the story. As a person who mainly wears silver jewellery and is always a little cautious about clashing yellow gold and cooler metals, I'm eyeing up the Found Talisman bracelet, which is a modern twist on a classic charm bracelet with a chunky chain adorned with imperfect chunks of silver. The mis-matched earrings, another Alighieri signature, are also destined for Instagram fame. Keep scrolling to shop the best pieces from the collection. Upgrade your choker with this sleek silver version. This makes any outfit look expensive. Alighieri is known for its mismatched earrings. This is a wear-with-everything necklace. So good it could even convert a gold jewellery person.